Sean Chaffin looks at the rise of PokerGO on the back of the game’s resurgence. It was a huge day for the world of poker at the Aria Hotel and Casino in Las Vegas on May 30. Amazingly to most, 48 players bought into the Super High Roller Bowl for $300,000 each. The final two battling were the most successful names in poker and represent a dichotomy in the game. Daniel “Kid Poker” Negreanu was the game’s all-time cash leader. He squared off against Justin Bonomo, on one of the biggest heaters in poker throughout 2018. It was the well-known poker star versus the poker star many outside of the game might not recognize. Bonomo would go on to win for $5 million and pass Negreanu to become the all-time money leader after also having a massive summer at the World Series of Poker (WSOP). His year included several other high roller wins for a total of $20.1 million as of mid-August. But beyond these two huge superstars, the Super High Roller Bowl spotlighted the growth of a fairly new medium for the game – the PokerGO app and its parent company Poker Central, which created the event live from the company’s new studio right on the Vegas Strip. To use poker parlance, the game is on a heater. The WSOP, World Poker Tour, and numerous other tours around the world are finding success as the game experiences a resurgence. While it may not be on par with the boom of the mid-2000s, poker seems to be on the rise and the people behind PokerGO/Poker Central are looking to take advantage. Poker Central was born in May 2015 in hopes of offering a 24-hour cable TV network focused on poker. The service was founded by pro poker and businessman player Cary Katz, founder of the College Loan Corp. After running into obstacles getting carriage on cable operators, the service changed course in 2017 – introducing PokerGO to customers and offering exclusive content for $10 a month. The company had already introduced some nice events, such as the Super High Roller Bow, but reaching a deal in 2017 to stream WSOP events not broadcast by ESPN was a major score. The service offered more than 40 hours of coverage for poker fans. The company also reached partnerships with poker pros like Negreanu, Phil Hellmuth, and Antonio Esfandiari to help promote PokerGO among players and fans. This summer, the service added even more WSOP coverage via a partnership with popular gaming site Twitch.tv, and also began showing regular high roller events from the Aria. PokerGO has become a one-stop shop for all things poker – with slick and professional production. So far, company officials are pleased where the service is headed. Beyond the WSOP, PokerGO/Poker Central has introduced new high-stakes tournaments such as the Poker Masters and US Poker Open, offering live coverage wire-to-wire. The company also struck deals to distribute the events episodically on the NBC Sports Network. Another move that pleased fans was the revival of the popular “Poker After Dark” series. The show returned in a live format to capture the feel of a high-stakes home game environment that was so popular in its original NBC incarnation from 2007 to 2011. Programming as well as other poker content are all available on the app at any time. The poker offerings, top-notch production, and quality commentary have helped the service win over many poker players and fans. Barry Carter is the founder of PokerMediaPro.com and a long-time writer in the industry. He believes the general quality of programming has helped the service grow. That content goes beyond just streaming poker content. The service features documentaries and other shows about players away from the tables. One new offering includes ‘Hand Histories’, offering a behind-the-scenes interview-driven documentary focusing on some of the most famous poker hands ever captured on television. The original series ‘Insiders’ followed some top pros on their quest for success at the 2018 Super High Roller Bowl. Poker is a unique game with an interesting history and colourful characters, and the service doesn’t seem to find a lack of interesting stories away from tournaments. ‘Stories from the Felt’ tells interesting stories from the game’s history, and ‘Pokerography’ tells the life stories of some of the poker’s best players. With PokerGO, the company hopes to build a service that goes beyond the felt. At the Aria, PokerGO not only featured two of the game’s greats, but also the company’s new venue – PokerGO Studio. The new facility was part of a partnership with the casino and was built at a cost of $25 million. The company hopes it features plenty of big-time live poker for years to come. The studio features a full production facility for streaming the game. A large open playing area houses nine beautiful poker tables including a main area for a feature table. There’s a cool ambiance with TV screens throughout, and a huge screen backdropping the feature table. During events, producers can add in a scene of the Vegas skyline or other graphics and photos. 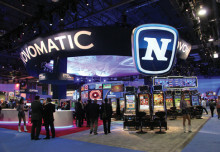 The 10,000-square foot facility holds millions of dollars of video and lighting equipment. The full set was built with poker specifically in mind, constructed from two adjacent art galleries in front of the casino. The studio also features areas for friends and family to take in the action including a lounge and fully-stocked bar. Another large room allows for player interviews, complete with green screen, and there is a room with an anchor desk for coverage during player breaks. The entire venue makes for a unique multimedia poker experience. The investment and partnership shows how much Poker Central and Aria believe in the future of live poker. “Poker After Dark” as well as the Poker Masters, US Poker Open, and some of the Aria’s regular high roller tournaments will all be streamed from the studio. Simmons said the impact the PokerGO Studio will have on the service can’t be understated. While PokerGO has found an audience and overcome some hiccups in its first year of operations at the WSOP, company officials realize there are challenges in reaching a large audience. Will there be enough poker fans to subscribe for the long-term? Will viewers and subscribers remain after the WSOP wraps up each July? There are also competitors offering well-produced content for free including other streaming poker tournaments. “I certainly think their product is very well produced and worth the money if you are a big poker fan,” Carter says. “The only concern for them in that respect is that some of the free poker broadcasts they compete with like the European Poker Tour stream, the partypoker MILLIONS streams, Poker Night TV, and the recent Triton Series, which are also of very high quality with no paywall. The company hopes its unique shows and coverage of major events and players set it apart in the industry. Working with Twitch, PokerGO provided final table coverage of nearly every WSOP bracelet event for both subscribers and non-subscribers this summer – culminating with everyday live coverage of the $10,000 Main Event. Simmons said the company is always looking to get better, but its coverage this year was an improvement from 2017. The WSOP, which is owned by Caesar’s Entertainment Corp, has a multi-year agreement with Poker Central and event organizers have been pleased with where the app is headed. WSOP executive director Ty Stewart said the company is even considering renewing its agreement early. Stewart said having poker people like Katz involved with the effort help ensure a quality product. It’s a relationship that works for both entities so far. Sean Chaffin is a freelance writer in Crandall, Texas. His work appears in numerous websites and publications. Follow him on Twitter @PokerTraditions. He is also the host of the True Gambling Stories podcast, available on iTunes, Google Play, TuneIn Radio, Spotify, Stitcher, PokerNews.com, HoldemRadio.com, and other platforms. Check out his book Raising the Stakes on Amazon.com.